A debate has started on Facebook about me banning a couple of people from a GD discussion group for disseminating alt-right ideas. Some people think that the issue is political and you should not be talking about politics on a Golden Dawn chat group anyway. While there is some truth in this, for me the issue is NOT political at all. Alt-Right ideas are not political at all but are the antithesis of everything the Golden Dawn represents. The superiority of white males. Hatred of Jews and Muslims and homosexuals. A misogynistic opposition to “feminism” which is a call for women to adopt traditional roles. The Golden Dawn founders were familiar with these views as they were typical of those which surrounded them in the late Victorian period. However, they were explicitly outlawed by the Golden Dawn which wanted to move away from them. Firstly, the Golden Dawn wanted to see equality between the sexes within magic. It is possible to make a case that the GD was formed for that purpose. It paid dividends to the GD as some of its most significant ritualists and teachers were women. A GD adept is sworn to protect equality within the order. Someone holding misogynistic views, or who wants women to get back to a support role to men, therefore, would not be allowed to take the 5=6 oath. Religious intolerance of any type is forbidden in the 0=0. All religions are said to “contain a light of the highest of which you seek.” So if you attack Jews or Muslim beliefs, you are insulting the Higher which manifests through them. Lastly, the Order teaches at that all things come from one thing and humanity is part of a single divine being. What race is Adam Kadmon? 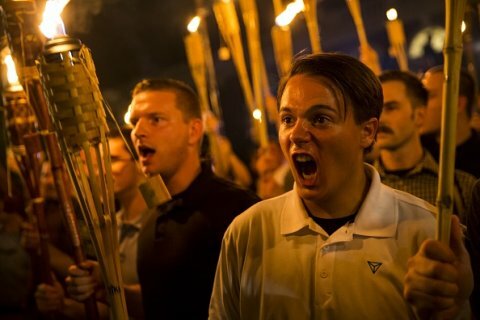 If you are saying white males are superior, you are disconnecting yourself from the unity which is the human race. Working against unity, against humanity, is not the path of a Golden Dawn magician. It is the path of something darker. So, this is why alt-Right types are unwelcome within the Golden Dawn tradition. This goes over and above any political beliefs that might be held about “guns,” “family,” “global warming” “abortion” etc. Of course, there might be some modern GD groups that disagree and allow race-hate, sexism, homophobia and intolerance amongst its members. It is just that in my little patch of the post-GD garden we frown upon such things. To me it is a bit like a Satanist wanting to be a Roman Catholic – there are fundemental reasons why such a mix is impossible. Personally I think that the Golden Dawn, despite is age is not the voice of conservative magic but rather liberal. Oh cry me a river. You don’t get to harp on about religious intolerance when you march with a group that tired to wipe out an entire religion through genocide. I think that comment was directed at the alt-righters, not you, Nick. I’m pretty sure he was talking about the neo-nazi group. I believe the “you” he was referring to are the alt-right and their snowflake whining about intolerance. Great article! That’s precisely why I find the alt-right to be antithetical to the principles of Thelema. Granted there are a number of so-called Thelemites who align themselves with this toxic worldview but they are delusional and not as nearly as numerous as they would have the rest of us believe that they are. Agree with everything but the satanist wanting to be a roman catholic part. I read about satanist in the 1800s who could only be baptized Catholic first and their priest were all renegade Catholic priest. this was during the inquisition where some felt God and his people were betraying them. Not this Atheism posing as Satanist today. Now….don’t get me started on woman bashing in Wiccan groups…. Pardon me for speaking my mind, but from the little research ive done, the GD has ties to freemasonry, a FRATERNITY bent on putting women in the kitchen. the Christian crosses does not help this assumption that the golden dawn was probably meant for christians to join it. I wont be a member of the golden dawn, because they are too well connected within Freemasonry and Christianity. Whatever Crowleys intentions were, wearing a christian cross around his neck gave the wrong impression about the golden dawn. I don\’t mean any offense here but you should have done more research. There is no universal Golden Dawn with ties to Freemasonry. There are many Golden Dawn groups nowadays, and some of them may have members or even a leader who is also a Freemason, while some of them don\’t. And yes there may be a Golden Dawn order out there with ties to Freemasonry, as there may be a Golden Dawn order out there with ties to Thelema, or even a Golden Dawn order out there with ties to Satanism, or Kemeticism, or Hellenism, or Asatru. You would be right to say that the Golden Dawn was sort of born out of Freemasonry and out of Rosicrucianism but it quickly went its own route. It was the first Occult group which let women into its order and also had women leaders from very early on. The Magickal system of the Golden Dawn is a continuation and amalgamation of earlier mostly Western Magickal systems and traditions, and as you are aware Christianity has left its mark on Western culture. People were indoctrinated with Christianity from an early age, so obviously the Magickal theories they came up with would have a strong Christian flavor to it. But then we find also Egyptian, Ancient Greek, Northern Germanic, and Jewish mythology, Magick and philosophy within the Golden Dawn curriculum. Christian magic or Christian Magick is kind of an oxymoron from a Christian perspective, and if the churches still had power, we would all be burned at the stake. The Golden Dawn system of Magick is a stepping stone for many people, a lot us were never very Christian to begin with, or were never Christian at all even, and a lot of people later move on to other forms and flavors of Magick which doesn\’t involve any Christian symbolism and/or mythology. Magick can be part of a religion (as it is part of Thelema or Wicca for example), but Magick in and of itself is not religion. Whether it involves religious symbology, or relies on religious mythologies is irrelevant in this. Hi Nick, You are wading into deep waters. Sure the term \”alt-right\” is used by white supremacist idiots like Richard Spencer. The problem is that the term has alos been extensively used as a propaganda tool by the extreme left in America ever since Hillary Clinton used the term to throw everyone right of Antifa into one huge \”basket of deplorables. : In other words, the entire notion of \”alt-right\” today is little more than a weapon of the American extreme left\’s ridiculous identity politics to demonize all opposition right of Antifa as \”racist.\” Need an example? Let\’s take Milo Yianopolous. He calls himself \”alt-right.\” Does Milo hate homosexuals. No. He is openly and flagrantly gay. Is he racist? Clearly not. Milo is into black men as his preferred sexual partners. Is he highly critical of the hypocrisy of modern feminism allying itself in cognitive dissonance with Islamic Supremacism and their misogyny? Absolutely. It is absolutely ridiculous and deserves to be exposed for the hypocrisy that it is. To be clear, Milo does not fit in any of your boxes. Why not? Because those boxes don\’t really exist, except as a defamation tool of the identity politics of the American left trying to stir racial tensions in the USA. So, what is YOUR point by using this \”alt-right\” defamation tool of the left? Are you deliberately trying to polarize the Golden Dawn community into 2 camps (Trump supporters vs. Clinton supporters)? Personally, I hate white supremacism, but I am definitely a fan of Milo and his defense of freedom of speech against the totalitarian leftist terrorist thugs of Antifa in Berkeley. The logic of your post, Nick, has more holes than swiss cheese because of the weaponized way the left uses the defamatory term \”alt-right\” to demonize everyone right of terrorist Antifa Communists. Nationalism and racism are 2 completely different things, despite the constant attempts to conflate the two as a political defamation weapon of the totalitarian left in America. Please get your facts straight, Nick. Oops. I forgot to mention. Does Milo hate Jews? Considering that he himself is a Jew the notion is completely ridiculous. If your intention was to alienate the Trump supporters in the Golden Dawn community by dragging the identity politics of the American radical left into the Golden Dawn community, you have done a fine job of it. Perhaps you should change the name of your order to the “Progressive Order of the Golden Dawn” though. It would be more honest. Are you unfamiliar with the political movement/party in Greece by the same name? Of course you’re going to have folks assuming they are one and the same. The omnisim approach that the golden dawn offers causes great confusion. As for myself, seeing that the Golden dawn has ties to freemasonry, i think ill will walk away from it. While I am pretty far Right myself and consider myself an “Ultra-Conservative American Exceptionalist” in the mold of Pat Buchanan, I don’t think that flat out racism, religious intolerance, and true homophobia and sexism have any place in the Golden Dawn either. I think people can have differing opinions about what to do with illegal aliens, whether or not affirmative action is fair or is an example of reverse discrimination, or whether or not you have to bake a cake for a homosexual wedding if your religion opposes that (I have no problem with doing it), but when it comes to clear cut examples of bigotry I have no problem with excluding them. It does go against what the Golden Dawn stood for. Just be fair and if a group on the Left like Black Lives Matter who preaches hatred towards whites starts spouting off, they should be out too. Truthfully, I don’t think there should be any politics at all in a Golden Dawn group other than what we’ve touched on here. I am pretty sick of not being able to do anything without hearing something about politics from one side or another. Sometimes you need a break.